COULD GOOGLE ‘PAID INCLUSION’ AID LOCAL BIZ? What burns me the most is without us, Google would have no business. They use our content to make money as they have no original content to contribute. And now they want to charge us a fee. Do no evil my arse. Pay for placement supplants what used to be free for advertisers with search optimized pages. Yes, it is indeed a change from Google pledges made in the past. However, it improves the search experience for users and its time has come. 1. Merchants with skin in the game will provide fresher information. Products will be up to date. 2. Affiliate sites that step in between Google and the merchant will lose traffic. This clears up inefficiency. 4. Merchants will have the opportunity to market special offers such as “30% off.” Advertisers can feed incentives directly to search results on page one. So what if Google fails the purity test? The reality is businesses change their minds in the service of customers and profits. Purity of ideals is not a winning strategy in the marketplace. All-in-all, 80% of Google’s activities have improved content relevance, including that from merchants. And contrary to the above, spending money to get better search results has never only been the province of big brands. 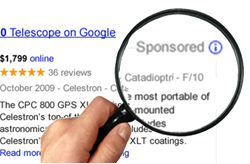 Google has become the dominant search engine by levelling the playing field for advertisers. In fact, it now IS the playing field. Google may see some budgets shift to Bing and Yahoo, but it will increasingly command higher shopping traffic. Advertisers of all sizes who play ball can win that traffic. Glad you enjoyed the read! Feel free to send any suggestions for topics you’d like covered.